Bring large saucepan of salted water to a boil. Add pasta from salad mix to water. Reduce heat to medium. Boil gently 12 minutes, stirring occasionally. Drain; rinse with cold water and shake to remove excess moisture. Meanwhile, in very large bowl, combine seasoning mix from salad mix, sour cream, mayonnaise, milk and salt; blend well. Add chicken, celery, sun-dried tomatoes, onions and bell pepper. Add pasta to chicken mixture; stir to combine. Cover; refrigerate at least 1 hour to chill, or until serving time. Just before serving, sprinkle contents of topping packets from salad mix over salad. Sun-dried tomatoes have had most of their moisture dried away, leaving intense tomato flavor. They are sold dry in bulk or in jars in oil marinade. Use marinated sun-dried tomatoes to give this salad lots of tomato taste. To reduce the fat in each serving of this salad by about 8 grams, use low-fat sour cream and low-fat mayonnaise. 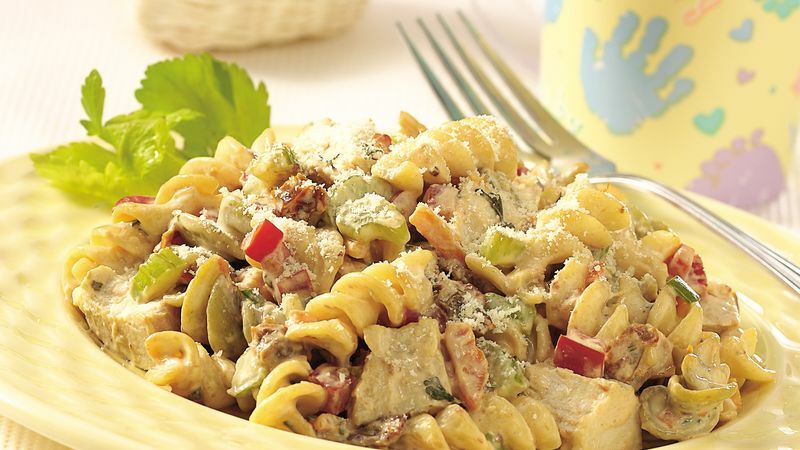 For more Mediterranean flavor, add a jar of marinated artichoke hearts to this salad; drain and coarsely chop the artichoke hearts before you add them.